This week we're discussing Maniac, a Netflix series starring Jonah Hill and Emma Stone. It's actually based off of a Norwegian series by the same name. Pretty neat, huh? This episode is available right here on the website. You can also find it on Apple Podcasts and all the other usual podcatching places. Make sure that you leave a 5 star rating and review. That will go a long way toward getting the show noticed by new listeners. If you want to get in touch with us you can find us on Facebook, Twitter, and Instagram @TrialByPilot. 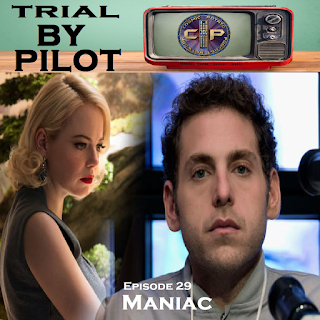 Or you can email us at TrialByPilot@gmail.com.